Good morning! 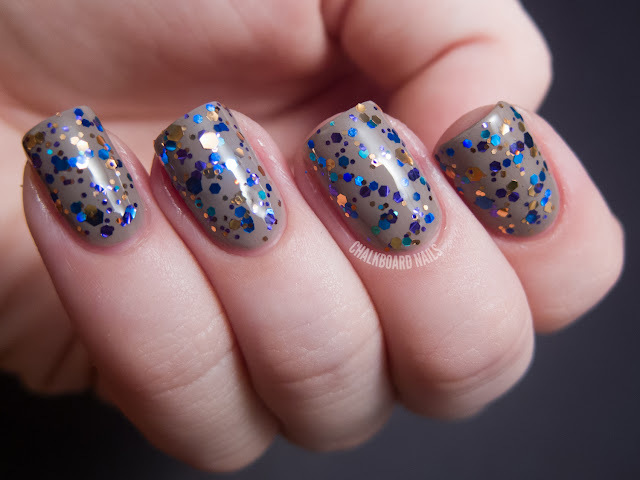 Today's post is a Sunday Swatch Spam, and the brand of the day is...drumroll...KBShimmer! KBShimmer is an indie beauty brand that makes and sells nail polish -- but that's not all! KBShimmer also sells soaps, bath bombs, and other related items. Cool! First we have Bejeweled. This is a glitter topper in a clear base, and I've layered one coat over OPI Berlin There Done That for my swatch. This is one of my favorite KBShimmers I've tried. I love the color mix in the glitter, very refined and appropriately jewel-like. Elle, from the Circus Collection, is a grey jelly base with muted pink, bright pink, grey, and silver glitters. I used three coats for the swatch you see here. I think this is a really unique color. You don't often see grey jellies, and the pink looks really nice with it. The glitter density in this one was good and applied evenly on its own. Glow Stick is from the Neon Collection. It's a bright highlighter yellow with holographic silver glitter. There are star glitters in this one but I didn't get any in my swatch, which shows two coats over white. It ALSO glows in the dark! You guys know how much I love glow in the dark polish! Very cool. Glows well with normal amounts of "light charging." Ice Queen is a beautiful silver holo glitter topcoat. I have shown one coat layered over OPI Into the Night. This one applied nicely! I think it would be a great way to jazz up any manicure. Ice Queen looks best over darker colors, in my opinion. Lilac Dreams is a super unique polish. It starts with a beautiful shimmering purple base, and adds blue, silver, and black glitter. Very cool. It even shifts a little bit depending on the angle, going from a purple to a warmer pinkish shade. This swatch shows two coats, & application was smooth. Orange Pop is an orange jelly base with multicolor micro, small, and medium hex glitter. This photo shows three coats of Orange Pop alone. I love this shade of orange! Radioactive is from the Neon Collection. It's a neon green polish with various large black glitter shapes and shards. Like Glow Stick, it also GLOWS IN THE DARK! I really love this one. The shade of green is great, and I enjoy the square glitters a lot. I've shown two coats of Radioactive over white. This one also glows well with a normal amount of "light charging." 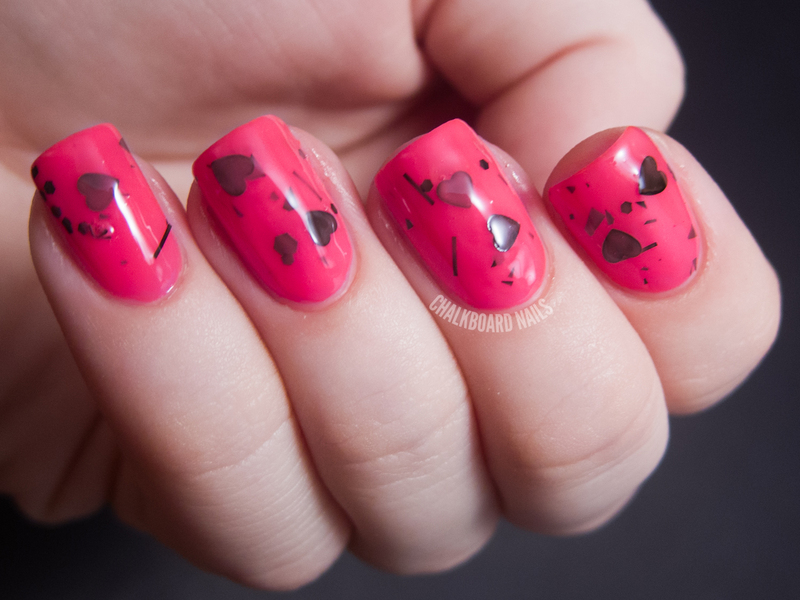 Shattered Heart is also from the Neon Collection. 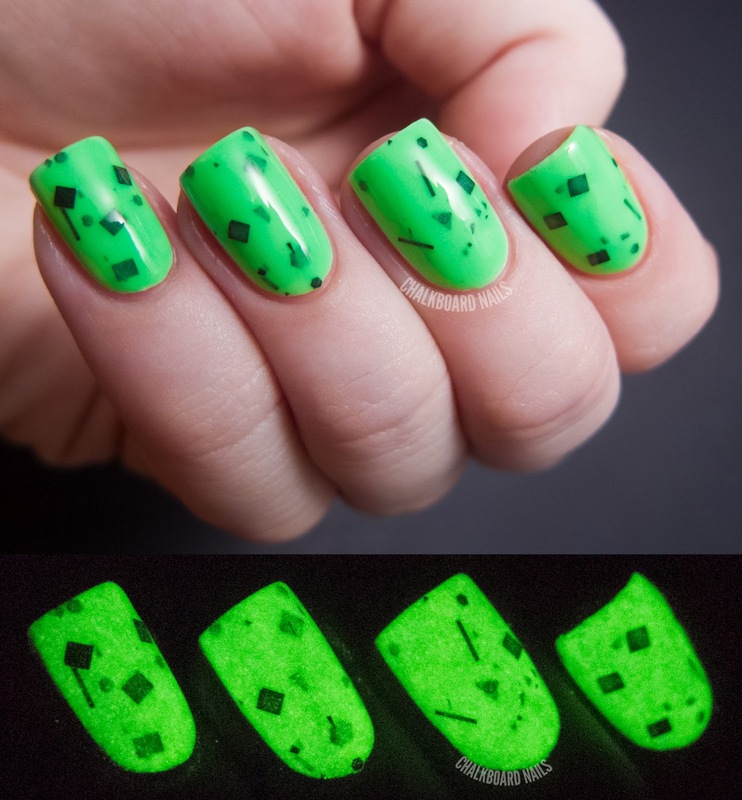 It's a sister to Radioactive (without the glow) in that they are both neon bases with various black glitters in them. The main difference is where Radioactive has squares, Shattered Heart has hearts. There are a lot of hearts in it, and they came out easily. No fishin' here! The only thing that I had a bit of trouble with on this one was evenness. I have pretty curved nails so there were a few spots where the hearts wouldn't lay completely flat. It's not a total dealbreaker though and this polish is still neat. 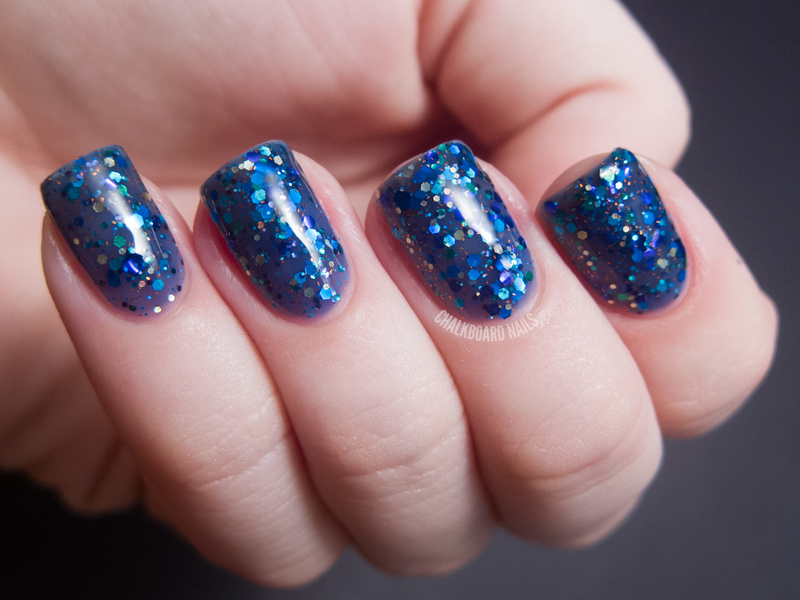 Shipwreck is a beautiful blue jelly base with multicolored glitter pieces floating around in it. I would recommend enlarging this photo, because it also has really cool coppery flecks in the base! They are almost like... micro bar glitters or something? My photo shows three coats of Shipwreck alone. Watercolor is from the Neon Collection. 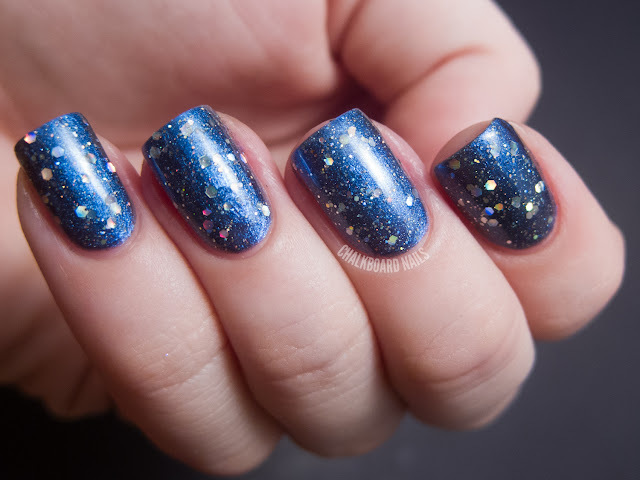 It's a gorgeous bright blue semi-sheer base, with silver, pink, purple, and blue glitters. I absolutely love this one. This swatch is three coats with two coats of topcoat for ultimate smoothness. I was really taken aback by the ease of application... oftentimes a polish with this much glitter will get thick and be very problematic to apply, but that wasn't the case at all. Which ones do you guys like? My favorites are Bejeweled, Radioactive, and Watercolor. KBShimmer products can be found on the KBShimmer website and on Etsy. International lacquer lovers who want to purchase can go through Harlow & Co. You can also keep up with KBShimmer on Facebook. My favorites from KB shimmer are Shipwreck and Band Geek, but after seeing Bejeweled and Watercolor I feel the need to own them as well. KB Shimmer does a wonderful job with their polishes and customer service. Beautiful Swatches you have here! I love all these! I haven't heard of thisbrand but I'll definitely have to check it out! These are all fab, but I especially love the look in your first photo! I love blue and grey/brown together. Love them all and the bath bombs rock. Oew I love the glow in the dark! These are amazing and so pretty! I love them all. Must add everything to my wishlist! They are lovely all of them, all though I prefer the brighter ones, thanks for sharing! These all look great. Love the ones that glow in the dark! I have Radioactive on right now, I love it! Spent a lot of time in bed last night going "no, LOOK! It GLOWS! It GLOWS IN THE DARK!!" ... I thought it was cool, anyway. Loved radioactive and shattered heart :) But I don't like that one other is called glowstick, the same as the Orly one..the exact same name and the same year. :S It would be more creative with just "glowsticked" or some other close but not the same. :) Who was first? I keep telling myself I bought enough indies this month, but then I see so many beautiful swatches! And I'm a sucker for glow in the dark polishes too. I have to add a few more KB Shimmers to my wishlist now! Beautiful, what a unique set of polishes! I literally want all of her polishes! Especially her new collection! All these glitters are awesome! Bejeweled, Shipwreck and Radioactive are really eye-catching! Gorgeous!! I love Orange Pop! Loving Elle and Orange Pop! Very gorgeous! My favorite is definitely Elle. That's exactly the sort of polish I would make! KBShimmer is one of my FAVORITE indie brands! I just used Ringmaster ;) I may need to pick up one of those glow ones, very cool! I love Elle, Glowstick, Lilac Dreams, Orange Pop, Radioactive & Shattered heart! Since I looked at the website.. also All American & Party! Ooo...I love the gray jelly base of Elle. Very unique. I discovered KBShimmer a couple weeks ago and I think I put a mental block on that brand because I was literally crying over every polish on their website. I want ALL of them. I'm mad at you for posting such pretty swatches because now I have to think about how much I want them all over again.